The surge in illegal border crossings is the result of poverty and violence in parts of Central America and has been fueled by false rumors being spread in Guatemala, El Salvador and Honduras that the U.S. is issuing “permits” to those who wish to live in the U.S. The immigration overhaul Alexander supported last year did not become law and did not change immigration policy. The TV ad – “Crisis in America” – began airing on June 26 and comes from the campaign of Alexander’s Republican primary opponent, state Rep. Joe Carr. The ad starts by saying, “There’s a crisis in America. Thousands of illegal aliens are overrunning our border.” That refers to the recent surge of migrants crossing illegally into the U.S. from Central America, and it is accurate. Obama administration officials held a conference call with reporters on June 20 to discuss a “surge” of illegal immigration from three countries in Central America: Guatemala, El Salvador and Honduras. Alejandro Mayorkas, deputy secretary of the Department of Homeland Security, told reporters that this fiscal year, as of June 15, “approximately 52,000 unaccompanied children have been apprehended along the Southwest border.” That’s double the 26,000 figure from the same time period in fiscal year 2013. Another 39,000 adults with children also have been apprehended as of May 31, Mayorkas said. The U.S. Department of Defense has agreed to temporarily house thousands of the unaccompanied children at three military bases – Fort Sill in Oklahoma, Joint Base San Antonio-Lackland in Texas and Naval Base Ventura County in California – because the surge has swamped Homeland Security’s existing detention centers. So, the problem is real. But the ad uses false logic to blame Alexander for it. The ad cites Alexander’s June 27, 2013, vote for the Border Security, Economic Opportunity and Immigration Modernization Act, which passed the Senate 68-32. The bill would have implemented various border security measures first, and then allowed those who were in the U.S. illegally to apply for provisional legal status and eventually citizenship – a process that would take at least 13 years. In an op-ed, Alexander explained his vote, saying the bill would increase funding to secure the border and create jobs. First, the ad is wrong to call the bill “amnesty,” as we have pointed out numerous times in the past when writing about bills that make citizenship conditional upon meeting numerous requirements. Second, the Senate-passed bill has yet to come up for a vote in the House, so Alexander’s vote did not change immigration policy. Even if it did become law, the bill would apply only to those living illegally in the U.S. before 2012 — so all those now crossing the border would not be eligible to apply for provisional legal status, let alone gain citizenship. At the time the letter was written, apprehensions of those illegally crossing the Southwest border were definitely rising — although the claim that they had “spiked dramatically” is a matter of opinion. Compared with the previous fiscal year, the number of apprehensions increased 15 percent in the first eight months of fiscal 2013, from October 2012 through May 2013, and 16 percent for all of fiscal year 2013, from October 2012 through September 2013, according to U.S. Border Patrol data. There were 414,397 apprehensions along the Southwest border in fiscal 2013 – up from 356,873 in fiscal 2012. But, historically, that’s still very low. The total is lower than it was in fiscal 2010, when there were 447,731 apprehensions, and much lower than it was in the early and mid-2000s, when apprehensions routinely topped more than 1 million per year. The Pew Hispanic Center in 2012 speculated that increased border patrols were responsible for a sharp decline in apprehensions of Mexicans illegally crossing the border and a weakened U.S. economy was responsible for a leveling off in the net migration from Mexico. What has been markedly different about the current surge is that it is coming from three Central American countries, not Mexico, and it largely involves unaccompanied children, not adult men looking for jobs. 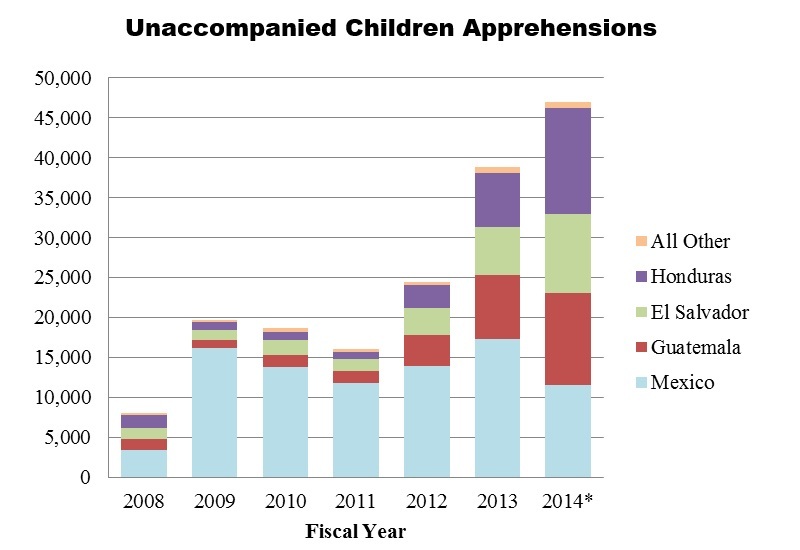 As we said earlier, the number of unaccompanied children illegally crossing the Southwest border has doubled in fiscal 2014, from 26,000 to 52,000, compared with the same period in fiscal 2013. The Congressional Research Office, in a June 13 report, noted that 73 percent of unaccompanied children apprehended on the Southwest border in fiscal 2014, as of May 31, came from three Central American countries and only 25 percent from Mexico. That’s an almost complete reversal from fiscal 2009, when 82 percent of unaccompanied children caught at the border were from Mexico and only 17 percent from the three Central American countries of Guatemala, El Salvador and Honduras. A CRS chart below illustrates the trend, which started in fiscal 2012, but exploded this year. Clearly, there is something going on specifically in Guatemala, El Salvador and Honduras. But who or what is to blame? There is a partisan disagreement over that. New York Times, June 16: While most men are held and processed quickly for deportation, border authorities struggling to manage the influx have been releasing pregnant women and parents with young children, allowing them to join family members living here and issuing them a deportation hearing notice. Migrants have sent word back home they received a “permit” to remain at least temporarily in the United States, feeding rumors along migrant routes and spurring others to embark on the long journey. New York Times, June 20: Until now, White House officials have insisted that extreme poverty and an epidemic of gang violence in those Central American countries were the main causes of the unanticipated spike in illegal migration. But many migrants also told Border Patrol agents they decided to set out for the United States after hearing that it was offering some kind of entry permit. Many other migrants who asked for asylum after being apprehended have been allowed to stay temporarily, further fueling hopes that Central American women and children were receiving special treatment. Republican critics say the president and his lax enforcement policies toward children are to blame for the surge in illegal immigration. Rep. Bob Goodlatte of Virginia, chairman of the House Judiciary Committee, and Sen. Ted Cruz of Texas are among many who specifically blame the president’s Deferred Action for Childhood Arrivals (DACA) policy, which allows immigrants who have been illegally living in the United States since June 15, 2007, to remain in the U.S. legally for two years. The DACA policy was an executive action taken without congressional approval. It was implemented by the Department of Homeland Security on June 15, 2012 — about one year before the Senate vote on amnesty. In a precursor to the DACA, the director of the U.S. Immigration and Customs Enforcement a year earlier — on June 17, 2011 — issued a memo that said immigration agents should use “prosecutorial discretion” when deciding whom to detain and deport. That policy — again taken without congressional approval — urged the deportation of those with criminal records before students, military veterans and others deemed to be low risk. Other Republican critics — including Sen. John McCain of Arizona, who voted for the comprehensive immigration bill — say the rumors were fueled by the administration’s slow response to the crisis and its refusal to send a clear message that those crossing the border would be deported. We don’t know how the rumors got started and whether the president’s actions or inactions are to blame. But, even if you accept the Republican premise, it still does not follow that the president “created this crisis only after Lamar Alexander voted for amnesty.” There is no evidence of a causal relationship between a Senate immigration bill that never became law and a current surge of Central Americans crossing the Southwest border. Correction, June 30: The original article misstated who would have been eligible to apply for provisional legal status and, ultimately, citizenship under the Border Security, Economic Opportunity and Immigration Modernization Act. The act would apply only to those who were living illegally in the U.S. before 2012.